I will remember Irene Gut Opdyke for her profound bravery in hiding Jewish victims in the home of a Nazi, despite all the risks. 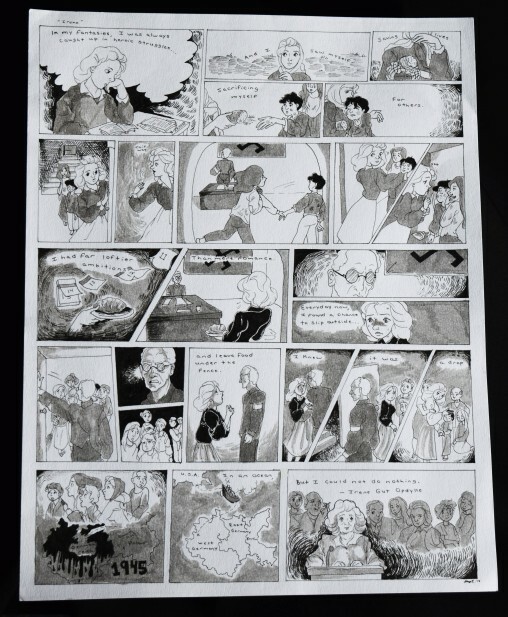 Choosing activity one, I drew in graphic novel form, since they handle mature subject matter. Her story spoke to me, so I interpreted her situation in the form of a short narrative. The panels feature quotes from her book to coincide with the situations Opdyke faced. Considering her story, I made it so this piece portrays the moments in which this courageous woman risked her life to save many even in the face of danger. Would You Walk in Her Shoes? My project represents courage and bravery. It takes a lot of courage to do what Irene Gut Opdyke did for the poor victims of the Holocaust. 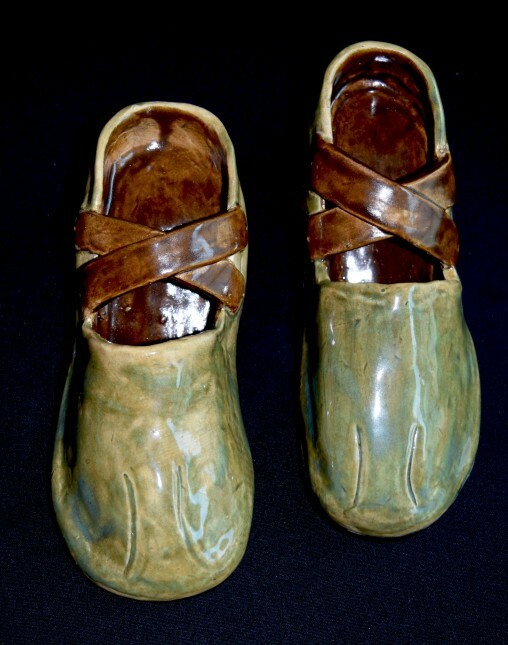 I sculpted shoes because I know it takes a lot to walk in her shoes, doing what she did to save those poor innocent people. A lot of people wouldn’t have done what she did, everyone would have just looked the other way and most people did. She did this for herself because she felt like it was right and it was her destiny. Irene was a very caring, kind person and what she did for the victims of the Holocaust was incredible. I’m not even sure I could do what she did; it takes a lot for someone to do what she did, knowing she could have been killed or captured as well in the process. So, would you walk in her shoes? This stool represents the work and courage of Irene Gut Opdyke and the faith of the Jews. Constructing a stool for it stands tall above everything like she did for the Jews. 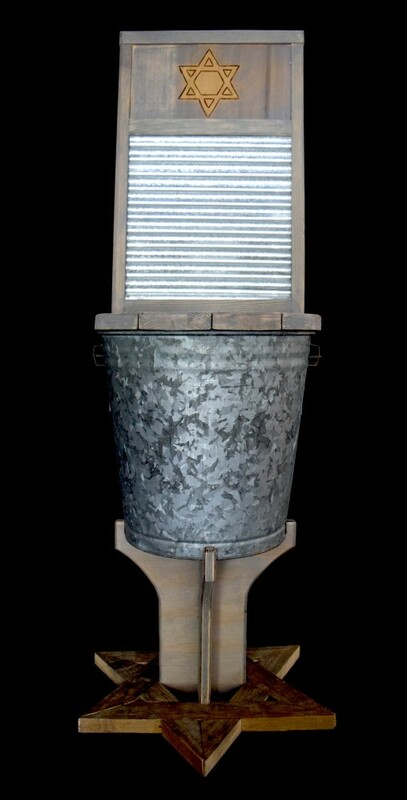 The back of the stool was designed as a washboard along with the seat being a washing pail to represent her. The base of the stool is a Jewish star to represent the foundation of the Jewish faith and hope. All together I created the piece to be looked at from the base up. As your eyes transition from the bottom the dirty Star, their hope fading, but through Irene Gut Opdyke a transformation happens. She cleansed them with her washing and helped the faith and hope grow, as is represented the the Star of David shining bright above everything else. My artwork takes a critical view of darkness and hope. Having engaged in a touchy topic I had to be sensitive to the truth. The Holocaust had many deaths and survivors. The lighter part of my image represents hope. There is a light at the end of every tunnel; through all the horrific times many pushed through to survive. The majority of my image is dark in color representing tragedy. I used a simple yet effective selection of material to develop my image. The lighter portion of the image was created by a cornered shadow. 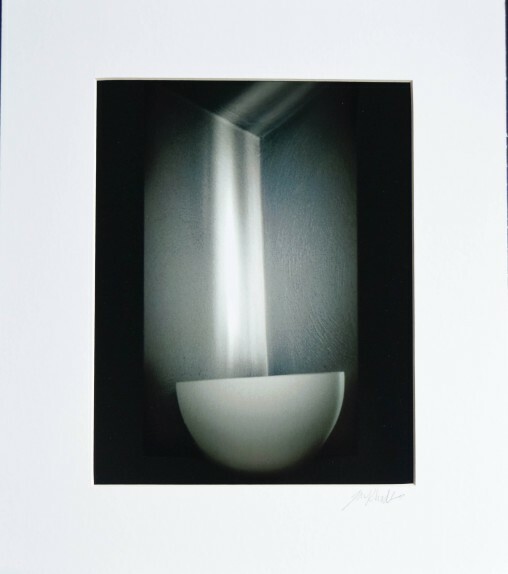 The main object used in the image was a lamp, giving the image a dramatic effect. Irena Sendler was a Polish nurse and social worker during World War II who saved over two thousand children. She placed each child’s name in a jar as she helped them, symbolized here by the rolled up papers and pictures of the children. The dried flowers symbolize and show respect for each life touched. My art project reflects this courageous woman. 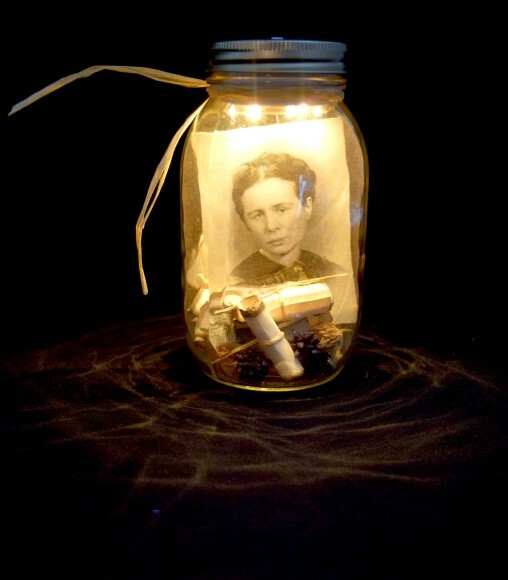 I have placed a picture of Irena in the middle of the jar as she is the main figure and the hero. There is a light shining on her because she was the light to so many during this dark period in our history. 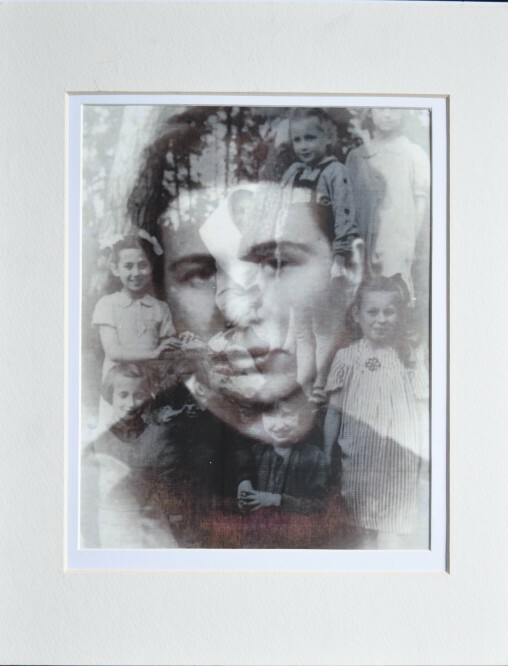 I chose to do a computer graphic illustration depicting Irene Sendler. This woman repeatedly put her life in danger to save Jewish children. This is the star of the many, many Jews that were shoved into camps and tortured till they day they died. But this star was also the star that the courageous saviors risked and sometimes lost their lives to help. Courage to me means the ability to want to do something no matter the obstacle. 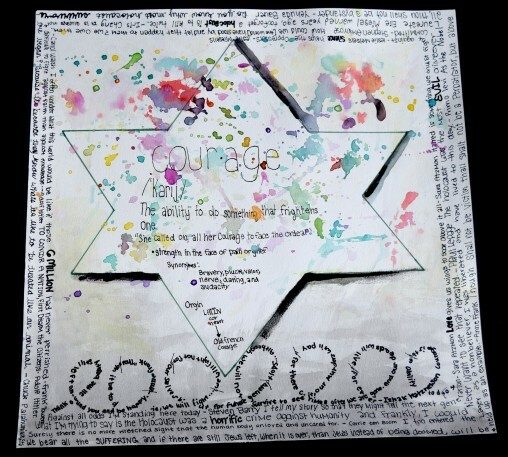 To me this artwork is very sad and gloomy just how the Holocaust was but the bright splatters of colors represent the courageous people that helped to stop the horrendous torturing of innocent people. This piece of art entitled “Reaching for Freedom” reflects that during the Holocaust, rescuers indeed had no profile. On the reaching hand, you will find many diverse individuals represented by items and patterns, thus showing that anyone can reach out and be a rescuer…a hero. The magazine letters are used to reflect the fact that many of these rescuers had no name, no identity…true anonymity. 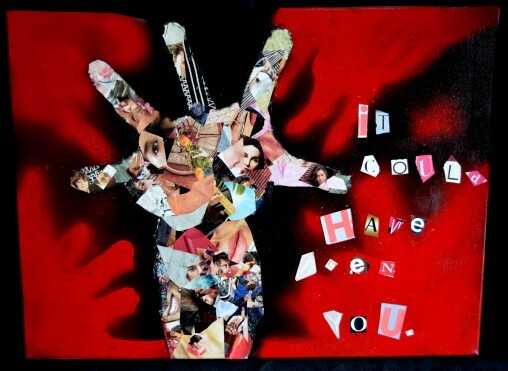 The black background represents the dark thoughts of fear of being caught and regret for those left behind, and the red, fiery tones of passion were what fueled the rescuing of the innocent from the camps, with all reaching out their hands to lead them to freedom.